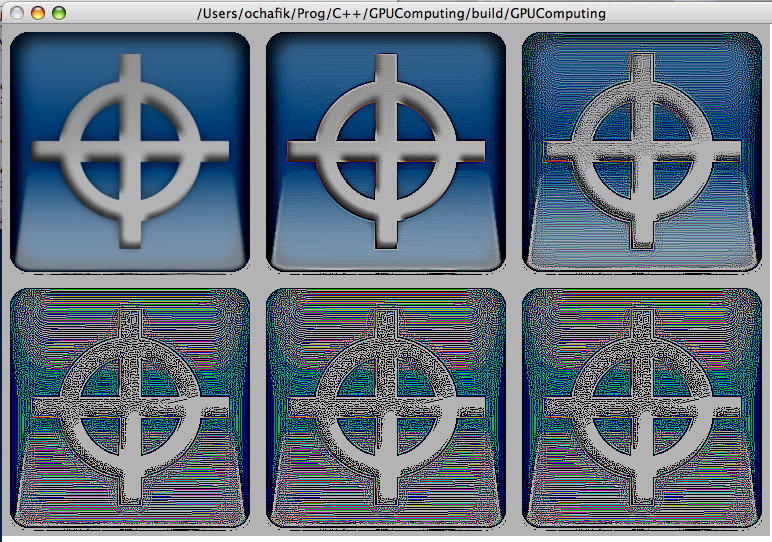 Here is a screenshot featuring cascaded image filters (fully defined inside a Cg fragment shader). Each filter can have any number of textures as input (typically one) and its output is done on one texture (but with some work, maybe I could get multiple output if needed). The only filter I have implemented so far is a generic convolution filter (with any possible kernel size and kernel values). This seems to run pretty fast (25 fps with 5 filters applied at each frame) on my GeForce FX Go5200 (poor graphic card of my PowerBook 12″, with 64 MB VRAM). Keep in mind that this framerate is achieved on a system, Mac OS X, that already makes an extensive use of the GPU !